For all its flaws, there was one thing that Miiverse was undeniably quite competent at, and that's sharing and hosting Super Mario Maker levels. You could fire that puppy up, see a post with a load of buzz around it, or even just one that looks vaguely interesting, and download it straight to your now-dusty Wii U console. It was by no means perfect, but if you wanted some new Mario Maker levels, it was the best place to go. So now with Miiverse cast aside like so many soggy used tissues, that leave a bit of a gap for the likes of Super Mario Maker 2 on the Switch. The tools certainly look more powerful than ever, but what about getting our levels into the mitts of other curiously-minded individuals who by some mad coincidence also own a Nintendo Switch and a copy of the game? We imagine codes will rear their ancient, fossilised heads again as Nintendo seems to have a hard time ditching them, but there's more scope here to make things even more delicious than Miiverse, and it involves using that four-worded piece of software many fear to mention; the Nintendo Switch Online App. Check out the video if you're curious to hear more, or type furiously in the comments about your blatantly superior method using Morse code in the comments below. I think I used Miiverse twice while I had my WiiU, but managed to get 70+ hours out of SMM. I'm sure the in house sharing service in SMM2 will be great. I personally loved Miiverse. It was a great way for not only gamers to connect with each other but served as a neat platform for developers to post updates and comments about their own games. Letting people download levels directly from the internet is a great idea, but I don't think it would necessarily need to use the Switch Online app. 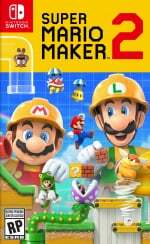 You can download games to your Switch from Nintendo's website, so I think they could probably have Mario Maker levels work a similar way to that. That way you could easily do it from a computer so you wouldn't need to be using a phone with the online app installed. @Monkeyofthefunk I still use it for my "SMM final"-series in which I make a level each week between the announcement of SMM2 and it's release. Pretty sure you'll be able to view lists of creations in-game along with friends' creations and the most popular/starred or recommended. Maybe even better, an in-game hub ala Splatoon. 2 years later, the UI is still a joke. A sad one. I also miss Miiverse. Sharing to Twitter and Facebook is fine, but I loved being able to share screenshots and drawings without bugging my non-gaming friends with them. I vote Nintendo bring it back in some form. Probably done in-game like with Splatoon 2's means of sharing drawings. Or alternatively, done via the much loathed Nintendo Switch Online mobile app. I would think that they would use whatever they use for Splatnet 2. Not that interested in Mario Maker 2 even if I would love to see a Zelda Maker eventually, I can say that I imagine they could come up with new and improved system for sharing in Mario Maker 2 or have a website you can use to search up levels. As for Miiverse I can say that many migrated to other places they could still get to chat with their Miiverse friends. While I might not have contact with everyone of my old friends from Miiverse, I do have contact with a fair amount of them still which I am really glad for :+). As long as they do a good job of integrating comments into the game without Miiverse then it's fine. Can find and share levels just fine without it. Posts to linked social media account like Twitter and Facebook. Super Mario Bookmark might be updated as well. SMM1 let you browse and favourite popular levels and creators perfectly fine without ever touching Miiverse. No reason the sequel wouldn’t do the same. The only thing Miiverse added was the ability to find a specific level or creator that wasn’t “popular” or had played one of your levels in 100-Mario challenge. But frankly it was as obtuse and illogical as any part of Nintendo’s online infrastructure. i'm sure they will find away to implement level sharing into the game. it's Nintendo. weather or not it will be good, remains to be seen. Simple via Twitter and Facebook. With a QR-code which can be read by the Mariomaker app which is connected to the game. Splatoon 2 implemented its own Miiverse, I expect Maker 2 can too. I'd be amazed if Nintendo didn't keep a server running with all the player levels on it. They probably found a way to copy over all the WiiU levels too. I didn't use Miiverse often, and while some features I did enjoy (Pikmin 3 pictures, Mario Maker comments, Splatoon drawings) went away with it, I'm not too affected by its removal. You can still share levels in Super Mario Maker for Wii U, yes, and yes, it is a bit more complicated now. But I doubt it'd be such a large issue for SMM2. I did create levels, shared levels, and enjoyed leaving and receiving personal compliments in Miiverse. For playing levels, however, I really ejoyed playing random levels with the 100 Mario challenge. Obviously some method of sharing levels is going to be a part of the software itself. I'm not sure why anybody would think that's dependent on MiiVerse. My biggest concern is that sharing levels will require a Nintendo online subscription, which will be a deal breaker in my book. I'm thinking they will expand the use of the FB, Twitter, etc. integration with the Switch, but the online app "is" in play I'd agree. Phone app required, of course. @Mountain_Man Your concern is valid. I hope they don’t lock features behind the paid subscription (unless online multiplayer mode is supported). The user interface and user experience was so well designed in the first Mario Maker, I have to believe the 2nd game will be equally smooth and enjoyable. If the online subscription is required, I would offer a level player ‘free’ with the subscription and the level creation tools as a separate purchase. It'll be through the app, obviously? Makes a lot of sense. Convenient, easier and more up-to-date than Miiverse. Was this seriously necessary to post as a story? It'll be via a very cumbersome app...and you'll have to put in a 20 digit code. I'd much prefer that they let us share QR codes on Twitter, and the app can read the QR codes. Boom, no stupid 20 letter things to type in. You mention Miiverse and the response from me is simply going to be one of longing for lost times... ...sniff. Nintendo will find another way for us to communicate with one another though. I don't want to look for levels on a browser, or on that awful nintendo app. Just make a nice in-game hub. Surely they will have some kind of online app that will sort it. Surely. Killing Miiverse was a terrible idea. They should have just rebranded it and made it part of the Nintendo Online Package. Nintendo's problem with Online is that they start from scratch with every generation rather then building on and improving what they already have. Hoping they do a cut down version so you can just play other people’s levels as I’m no good at making my own. I don't think I ever used Miiverse to share or discover levels on SMM. I guess commenting was done via Miiverse, but that can be just done in-game. I had it confirmed by a Nintendo employee that no update for the UI is planned anytime soon. I agree it leaves a lot to be desired. I just want to be Mii! Does anyone else say along "Heello there Lovely people, it's Alex from Nintendo Life Heere"? Hummm. I am thinking about if I should post an invite code to a Discord server that's made by and for people who originally was on Miiverse and use the server as their internet home now, but I am wondering about if that is allowed or not since it technically isn't allowed to post links to other sites and such or self promotion at least. Still, I was thinking about this since some people here seem to be missing Miiverse and thought letting them come to a Discord server that's for Miiverse people could be an idea. In case wondering, this Discord server is made by people who primarily were in the Zelda community. So yeah, wanted to hear first about if this is something that would be allowed or not. I just don't know why Nintendo never allowed us to send levels to people on our friends list. Nintendo will almost certainly implement a custom sharing feature specifically for Mario Maker 2. Ladies and gentlemen, I think we just found another use for Nintendo's Online App. Could also have a platform for sharing Smash pictures and videos. Right now it's very cumbersome. @Franklin I believe that's what the Smash World service is supposed to be, whenever that launches. Well, they could always use the same method they used to share custom stages in "Super Smash Bros. Brawl." True, it's not a very efficient method, but it works. Now I think about it there should be a less cumbersome way to share Switch screenshots generally. @Franklin You can directly share screenshots and videos to Facebook or Twitter if you link your accout to the Switch. Yes, but you can't send as a message. I thought Miiverse was a great idea but I am also very well aware of why it fell apart, it was really over-moderated to the point to where everything had to be super politically correct and kid friendly. I remember making a fart joke in the sketch game for Game and Wario and my account was banned for two weeks because of it, I think that serves as a good example of how ridiculous it was. Still, in games like Mario Makes it worked very well. I think they just need to give you the same messaging capabilities within the game but have it attached to your online account.